POW`s were housed in the Tannery, the "Jump" was the river crossing bridge in the centre of the village. The Tannery had various uses; in the 1914-1918 war German prisoners of war used the drying shed as a dormitory, their names remaining until 1985 on small white cards above the places where their beds had been. Bures Old Tannery still survives, a medieval timber framed dwelling of charm and atmosphere; the old drying shed, more recently the garage, and barn, are no more. On their site is the new dwelling house named Bridge House. In 1946, the year after the end of World War Two, more than 400,000 German prisoners of war (POWs) were still being held in Britain, with POW camps on the outskirts of most towns. Clement Attlee's post-war government deliberately ignored the Geneva Convention by refusing to let the Germans return home until well after the war was over. During 1946, up to one fifth of all farm work in Britain was being done by German POWs, and they were also employed on road works and building sites. Fraternisation between the soldiers and the local population was strictly forbidden by the British government, and repatriation progressed extremely slowly. Then the ban on fraternisation was finally lifted - just in time for Christmas 1946. In towns across Britain, many people chose to put the war behind them and invite German POWs to join them for a family Christmas - the first the men had experienced in years. The only German prisoner from WWI to be interred in Bures Cemetery according to The German War Graves Commission was Lance-Corporal Carl Volker. Carl Volker was born in Liebenstein in the Germain State of Thuringia on the 2nd August 1879, and was a tailor by profession. 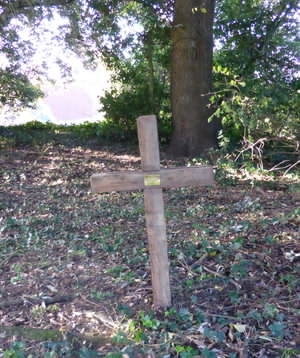 The German War Graves Commission states that Lance-Corporal Volker was a soldier serving with the 3rd Royal Prussian Infantry Regiment based inHanover. He was captured shortly before the end of the war in Noyelles, France on the 28th of September, 1918 and subsequently brought to England. In the immediate aftermath of the war Lance-Corporal Carl Volker was originally posted as "missing" in the German War Losses Register. However, although he was registered with the huge POW camp in Pattishall, Northamptonshire, Carl Volker was interned in Bures, probably in the Prisoner of War camp installed in the drying shed of the Tannery located by the bridge, generally known those days as "the jump" and where Bridge House stands today. Road were created with the help of these prisoners. 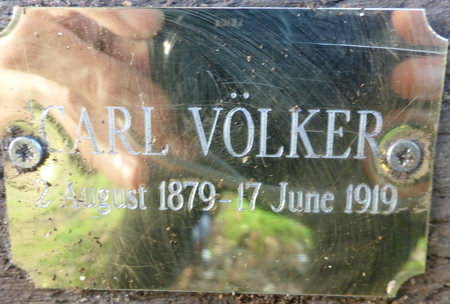 Unfortunately, Lance-Corporal Carl Volker was drowned on the 17th of June 1919 while taking part in a bathing parade at "the jump", he was 39 years old. Carl Volker left a widow, Emma, still living in a flat in Hanover in 1929.